Job Opportunities | Cultural Resource Analysts, Inc. Since 1998, CRA has introduced a variety of student interns to cultural resource management, some of which have gone on to full employment with CRA. If you are interested in potential internship opportunities, please send an email with your interest and resume to Bridgette Robinson. CRA is always looking for qualified, highly-motivated professionals to join our team. We work on a wide variety of projects each year across a full range of cultural resource services and are constantly building upon our reputation for responsive, high caliber work. This reputation is rooted in each and every one of our staff, including our archaeologists, architectural historians, editors, cartographers, and administrative personnel. If you are ready to contribute to our mission of providing outstanding service to our clients across the country, we want to hear from you. CRA offers competitive salaries and a benefits package that includes health, dental, and vision insurance; life insurance; a retirement savings plan; and paid time off benefits. CRA is an equal opportunity employer. Want to submit a general inquiry regarding employment opportunities or be considered for a position not posted below? Please submit your information via our contact form so that we can make sure it gets to the right person. CRA seeks an experienced Accounting Clerk willing to work in a fast paced, ever changing, ambitious environment. The candidate will be expected to learn and implement new procedures within existing software programs. CRA seeks an entry or mid-level Architectural Historian to work out of our Lexington, Kentucky or Knoxville, Tennessee office. We are considering applicants for a full-time position as well as those interested in part-time/on-call work. CRA seeks a Historic Staff Archaeologist with regional (i.e., Southeast) experience to work out of our Knoxville, Tennessee office. 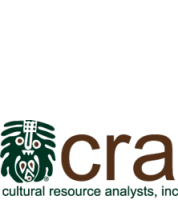 CRA’s Knoxville, Tennessee office seeks an Historic Staff Archaeologist with regional (i.e. Southeast) experience. Experience in Tennessee is desirable. The qualified candidate must have a graduate degree in Anthropology, a minimum of 3-5 years of experience conducting archaeological survey, and a focus on historic period materials. Candidate must meet the Secretary of the Interior Standards (36 CFR 61) in archaeology, and should have demonstrated skills in CRM, including supervisory experience on Phase I projects. The candidate will be expected to direct and manage phase I surveys for clients in both the public and private sectors, including multiple projects at a time. Expect frequent stays away from the office. Specific duties include managing field crews, conduct analyses, interpret analytical data, and write reports. The ability to write clearly and professionally is very important. Familiarity with the use of GPS units is expected. The candidate needs to be detail oriented and have excellent verbal and written communication skills, strong organizational skills, and must be technologically proficient including experience with databases. It is imperative that the candidate be able to work 8 to 10 hour days (or longer if necessary) in a variety of conditions. Stooping, bending and lifting are essential functions of this position. The position is a full-time, salaried position with a full benefit package. Salary is commensurate with experience. Please submit a letter of interest, resume, three professional references, and a writing sample to Bridgette Robinson via email at barobinson@crai-ky.com. Cultural Resource Analysts, Inc. employees are required to undergo a background check that includes driving history. CRA reserves the right to perform drug/alcohol testing as a condition of continued employment. Please contact Tennessee Operations Director, Travis Hurdle, via email at twhurdle@crai-ky.com or by phone (865) 304-9141 with questions about the position. CRA seeks a Staff Archaeologist to work out of our corporate headquarters in Lexington, Kentucky. CRA is seeking qualified candidates for a Staff Archaeologist position in our Lexington, Kentucky, office. The ideal candidate will have a M.A. in anthropology with experience working in the Southeastern U.S., a minimum of three years of supervisory experience in cultural resource contracting, and meet the Secretary of the Interior Standards (36 CFR Part 61) in archaeology. Other qualifications include excellent writing and verbal communication skills, strong organizational skills, and technological proficiency that includes some experience working with GIS and relational databases. Specialized skill sets, such as historic material cultural, archival research, lithics, geoarchaeology, geophysical survey, prehistoric ceramics analysis and/or mortuary studies, are preferred. A working knowledge of relevant historic preservation legislation and regulations is essential. Applicant will be registered with the Register of Professional Archaeologists or will be eligible for listing as a Registered Professional Archaeologist. Primary duties will include: Responsible for assigned phase I (inventory-level survey), phase II (National Register evaluation), and phase III projects throughout the Ohio Valley, Mid-West, and Southeastern U.S. This will involve conducting pre-field research, directing fieldwork and laboratory analysis, and preparing technical reports. It is imperative that candidates be able to work 8 to 10 hour days in a variety of conditions and understand that there will be frequent stays away from the office. Stooping, bending, and lifting are essential functions of this position. This is a full-time, salaried position with a competitive benefit package. Salary is $16 to $22 per hour, more if warranted by experience, education, and training. Please submit letters of interest, resume, three professional references, and a writing sample to Bridgette Robinson via email at barobinson@crai-ky.com. Cultural Resource Analysts, Inc. employees are required to undergo a background check that includes driving history. CRA seeks a Staff Archaeologist to work out of our Evansville, Indiana office. CRA is seeking qualified candidates for a Staff Archaeologist position in our Evansville, Indiana office. The ideal candidate will have a M.A. in anthropology with experience working in the Southeastern U.S., a minimum of three years of supervisory experience in cultural resource contracting, and meet the Secretary of the Interior Standards (36 CFR Part 61) in archaeology. Other qualifications include excellent writing and verbal communication skills, strong organizational skills, and technological proficiency that includes some experience working with GIS and relational databases. Specialized skill sets, such as historic material cultural, archival research, lithics, geoarchaeology, geophysical survey, prehistoric ceramics analysis and/or mortuary studies, are preferred. A working knowledge of relevant historic preservation legislation and regulations is essential. Applicant will be registered with the Register of Professional Archaeologists or will be eligible for listing as a Registered Professional Archaeologist. Primary duties will include: Responsible for assigned phase I (inventory-level survey), phase II (National Register evaluation), and phase III projects throughout the Ohio Valley, Mid-West, and Southeastern U.S. This will involve conducting pre-field research, directing fieldwork and laboratory analysis, and preparing technical reports. It is imperative that candidates be able to work 8 to 10 hour days in a variety of conditions and understand that there will be frequent stays away from the office. Stooping, bending, and lifting are essential functions of this position. Cultural Resource Analysts, Inc. (CRA) is seeking mid-level or senior-level Architectural Historians in support of the recovery activities and undertakings of FEMA for presidentially declared disasters in the state of AL, CT, DE, FL, GA, KY, MA, MD, ME, MS, NC, NH, PA, RI, SC, TN, VA, VT, and WV. These activities include assistance to ensure expeditious resolution of issues associated with compliance with environmental and historic preservation laws, regulations, and EOs, including the National Environmental Policy Act (NEPA) and National Historic Preservation Act (NHPA), among others. FEMA support will be provided in reviewing recovery projects within the designated disaster areas to ensure that these actions comply with environmental and historic preservation laws, regulations, and EOs. This support will generally require staff in Joint Field Offices or other area field offices as needed. U.S. citizenship and a valid driver’s license are required for these positions. Candidates must have either an advanced degree in Historic Preservation or Architectural History and 5 years of experience, or a Bachelor’s degree and 10 years of experience; senior-level applicants should have either an advanced degree in Historic Preservation or Architectural History and 10 years of experience, or a Bachelor’s degree and 15 years of experience. Candidate familiarity and availability to meet emergent requests and rapid mobilizations are essential, as deployment notices may come as little as 48 hours’ in advance. Successful candidates are preferably those who are currently FEMA badged or have been previously badged, and can demonstrate disaster response experience. Candidates must demonstrate the technical expertise required to identify historic properties, evaluate the effects of projects on historic properties, and have experience coordinating and consulting with State Historic Preservation Officers. Additionally, candidates must be detail oriented, well-organized, an excellent verbal and written communicator, and technologically proficient with experience in working with databases. Specific duties may include working with staff to oversee projects, attending kickoff meetings, conducting fieldwork, managing fieldwork crews, conducting analyses, interpreting analytical data, preparing status reports, and writing technical reports. Currently, candidates are anticipated to be deployed between two months and up to one year. This may be revised as additional details develop with a given task order, so this represents our current understanding. Work may be in urban, rural, remote, rugged, inclement, and/or disaster settings with limited resources and are expected to be prepared for these variable fieldwork conditions. It is imperative that candidates be able to work 8 to 10 hour days (or longer if necessary) in a variety of conditions. The pay rate position is $37.50 an hour for the mid-level position and $55.00 an hour for the senior-level position. Additionally, “time-and-a-half” pay may be authorized, depending on the task order. Please submit letter of interest, resume, three professional references, and writing sample to Bridgette Robinson via email at barobinson@crai-ky.com. If not already FEMA badged, candidates will be expected to undergo a Department of Homeland Security background check and finger printing. CRA reserves the right to perform drug/alcohol testing as a condition of continued employment. Cultural Resource Analysts, Inc. (CRA) is seeking mid-level Staff Archaeologists in support of the recovery activities and undertakings of FEMA for presidentially declared disasters in the state of AL, CT, DE, FL, GA, KY, MA, MD, ME, MS, NC, NH, PA, RI, SC, TN, VA, VT, and WV. These activities include assistance to ensure expeditious resolution of issues associated with compliance with environmental and historic preservation laws, regulations, and EOs, including the National Environmental Policy Act (NEPA) and National Historic Preservation Act (NHPA), among others. FEMA support will be provided in reviewing recovery projects within the designated disaster areas to ensure that these actions comply with environmental and historic preservation laws, regulations, and EOs. This support will generally require staff in Joint Field Offices or other area field offices as needed. U.S. citizenship and a valid driver’s license are required for this position. Candidates must have either an advanced degree in Anthropology or Archaeology and 5 years of experience, or a Bachelor’s degree and 10 years of experience. Candidate familiarity and availability to meet emergent requests and rapid mobilizations are essential, as deployment notices may come as little as 48 hours’ in advance. Successful candidates must demonstrate experience in at least one of the 19 states identified, are preferably those who are currently FEMA badged or have been previously badged, and can demonstrate disaster response experience. Currently, candidates are anticipated to be deployed between two months and up to one year. This may be revised as additional details develop with a given task order, so this represents our current understanding. Work may be in urban, rural, remote, rugged, inclement, and/or disaster settings with limited resources and are expected to be prepared for these variable fieldwork conditions. It is imperative that candidates be able to work 8 to 10 hour days (or longer if necessary) in a variety of conditions. The pay rate for the position is $30.00 an hour. Additionally, “time-and-a-half” pay may be authorized, depending on the task order.